As you can tell, I am pretty much into hunting even though I personally don’t hunt. My husband, son, and dad and brother-in-law are the hunting crew. My part in hunting is the fun part as far as I am concerned, shopping for the latest, greatest, toughest, most hard-working products that they will be taking with them from boots to luggage! This is not an easy task, but as a self-proclaimed shopping diva I think I have the skills that I need in order to find the best of the best! 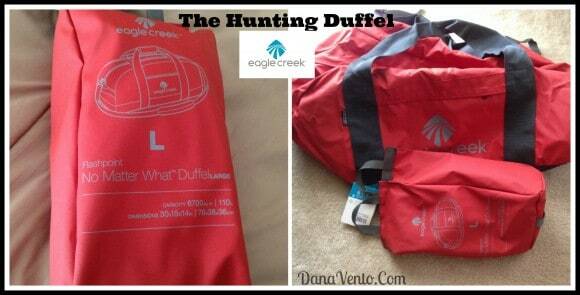 Lavishly live packing up for hunting out loud with me as we take a look at The No Matter What Duffel from Eagle Creek and get those guys packed up and out hunting, so I can get out and go shopping some more! We packed up a size Large No Matter What Flashpoint Duffel, so I know they will be gone for a while. My love of Eagle Creek Gear is beyond words, if I had to pick a brand to discuss nonstop for luggage and everything packing it would be Eagle Creek without question. The quality of their product is second to none. It should not surprise you to find out that the bag my guys took hunting was from Eagle Creek. The No Matter What Flashpoint Duffel we packed up was a size Large, so you can gauge how big or small this is. Look at the little package it morphs back into when not in use. This is awesome! This has plenty of room for extra under garments, tees, jeans, socks, etc, so no matter what the day holds, this bag can hold even more. From the affordability factor, this is all I have to say, it is affordable, you get what you pay for and again the No Matter What warranty makes the bag worth its weight in gold! 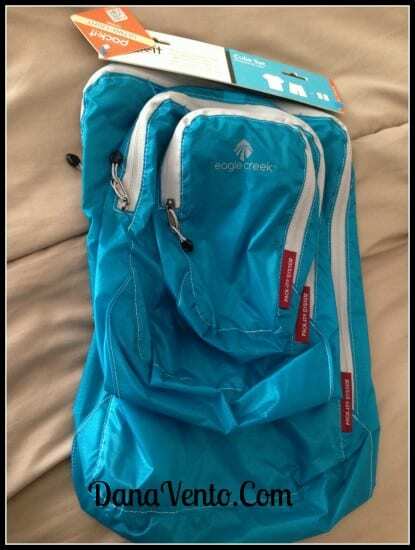 If you put items into this bag they are going to stay clean and dry as it is water resistant and won’t melt if a snowflake or rain drop hits it. 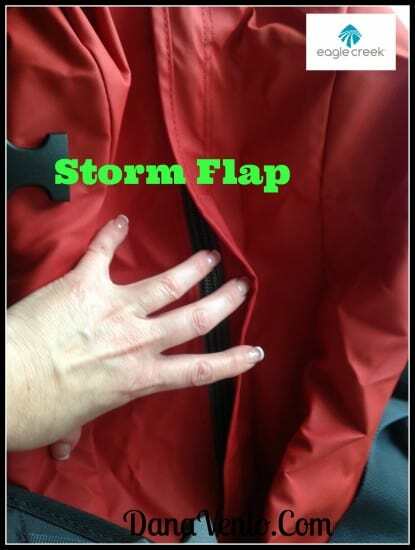 The #10 lockable, self-repairing zippers with storm flap and the removable padded shoulder strap adjusts to making carrying this, comfortable. The top carry handle is perfect for the hands of guys as it offers super durable, over-sized webbing. I might mention too, that if you have an over-packer on your hands(not many guys I know, but just saying..) there is Bartrack reinforcements on all stress points so they can pack it in without worry of busting seams! Do they make this stuff for clothing, lol! 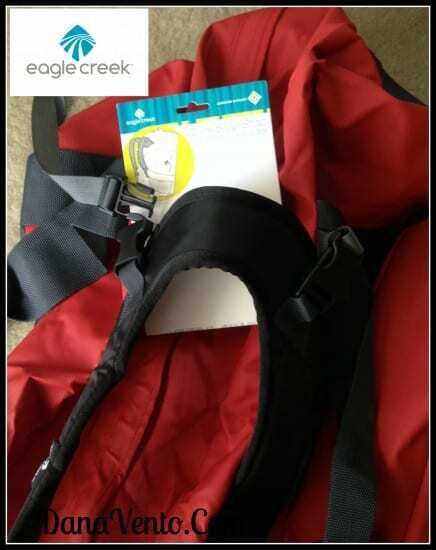 With over-packing in the conversation, there is not better time to talk about Eagle Creek Pack-It sets that are cube sets that let you organize the packing when it begins. The Pack-It lets the organization begin and is a way to maximize the packing space and protect your clothes because it is stain and water-resistant. These are amazing little pieces that make a HUGE difference when packing items like socks, tees, undies. No loose items are then moving about in the bag and you know where everything is(or your hunter will know) because it is all sorted and cubed! Sometimes when my boys are just going over night to my moms, they simply organize their needs into these simple pieces and take no more, because it is simple and precise packing. Let’s talk about the No Matter What warranty, because No Matter What happens to this duffel it is covered by the warranty so this bag is more of a you should not miss the opportunity to own it! It is outside perfect, rugged and constructed of Bi-Tech Fabric. The colors are perfect for those guys in your life.. in other words there are no pinks in this collection but there are 4 colors to choose from and 4 different sizes, depending on how long our hunter is leaving home. When the last day of hunting hits this year, and the guys return home this will pack right back into its own small bag making it a small storage item and well-kept! This is how you can lavishly live packing out loud, with one very versatile, rugged back that can not only withstand the elements but anything that you toss into it. I love that it can be carried, shouldered or backpacked and it is a must have when hunting or even traveling. *product was provided to facilitate review however.. thoughts, opinions, and uses are all thought of on my own as are the images!